Is your site known to JPL? scheduled to begin next week to determine whether it can be brought back into service. There are several important changes in CloudSat operation associated with these events. Because of the power supply issues, CloudSat will no longer be able to operate in eclipse, i.e. when the earth under it is in nighttime. It might still be visible at night, while emitting in daylight, at very low elevations. as large as 6 degrees, although the engineers are hoping to eventually fix this and return control to within 1 degree of nadir. This means that the cone of avoidance is much larger than before and NASA suggests that radio telescopes might wish to cease 94 GHz operations during the daytime if they cannot ensure avoidance of this wider cone. Sometime after 1 October 2005, NASA will launch a JPL-Colorado State cloud-mapping experiment called CloudSat. In a near-polar orbit at 705 km altitude with a 99-minute period, CloudSat will carry a pulsed, 1.8 kW, narrow-band, 94.05 GHz radar feeding a nadir-pointing (downward-looking), high-gain, off-axis parabolic antenna. This global mapping experiment, part of NASA's "A-Train" (pictured), will fly overhead, or very nearly so, at a substantial fraction of the world's observatories: just which ones are overflown during a given few-week period will change slightly with time and will only be known after launch. Power levels of the CloudSat radar are such that an SiS-junction deployed on a typical radio telescope could be burned out if the telescope is pointing at the zenith during an overflight. Moreover, an SiS receiver will probably saturate during an overflight (or near overflight) no matter where the radio telescope is pointed, and similarly-strong signal levels would be received if a telescope points at or near CloudSat whenever the satellite is above the horizon (which could be of order one hour per day at a typical location). The narrow-band, Doppler-shifted radar signal will probably be detectable in even fairly short integrations no matter where a radio telescope is pointed, whenever CloudSat is above the horizon. How did this happen and what can I do about it? 5.562--The use of the band 94-94.1 GHz by the Earth exploration-satellite (active) and space research (active) services is limited to spaceborne cloud radars. 5.562A--In the bands 94-94.1 GHz and 130-134 GHz, transmissions from space stations of the Earth exploration-satellite service (active) that are directed into the main beam of a radio astronomy antenna have the potential to damage some radio astronomy receivers. Space agencies operating the transmitters and the radio astronomy stations concerned should mutually plan their operations so as to avoid such occurrences to the maximum extent possible. Why am I only finding out about this now? As may be seen in footnote 5.562A, permission was granted contingent on mutual planning with radio astronomy. Although successive IUCAF chairmen contacted NASA and the CloudSat team in December 2000 and again in June 2001, nothing of consequence was forthcoming until the radio astronomy community was approached by the CloudSat project team at the end of June 2004. Shortly thereafter, acting on behalf of the worldwide radio astronomy community, IUCAF brought its concerns to the attention of the annual Space Frequency Coordination Group (SFCG) meeting in September 2004, which adopted SFCG Resolution 24-2 on this issue (see the blue text box at the bottom of this page). What should my observatory do in response to CloudSat? The radar cannot be turned off when it flies overhead, and can cause problems for observing even when far from the zenith. 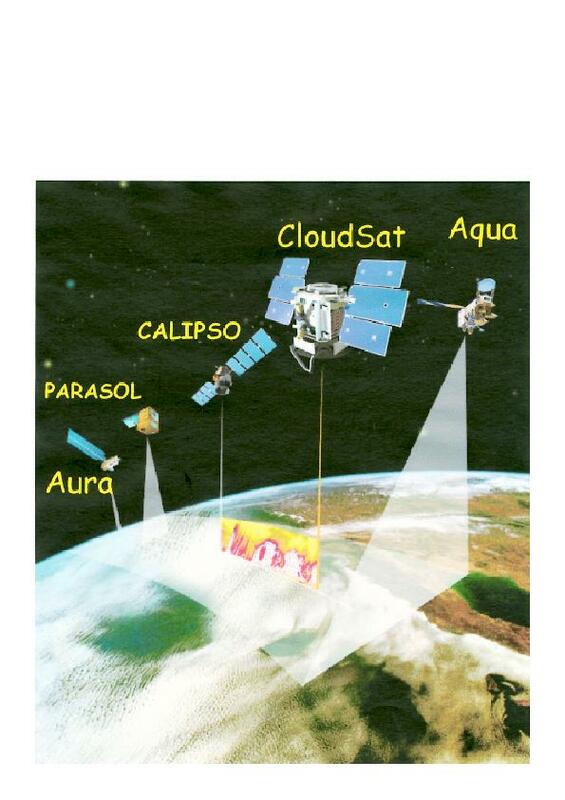 Therefore, each observatory will have to formulate a response to the presence of CloudSat which is contingent on its particular observing practices, the characteristics of its electronics, geographic location, and so forth. At the very least, it is probably unwise to park mm-wave telescopes near the zenith while CloudSat is operating. But first it will be necessary to acquire some familiarity with CloudSat's operating characteristics and the general properties of its orbit. This web site is designed to provide enough information to get a good start with these things. Where can I go for the information needed to protect my telescope? Detailed pre-launch specs provided by JPL for the CloudSat radar are given in the link at left called "JPL Technical Info" and a technically-informed discussion of CloudSat's impact on ALMA is contained in the ALMA memo 504 linked just below that. This document should serve as a template for understanding CloudSat in the radio-astronomical context. It also contains some illustrative examples of CloudSat's orbit characteristics, based on the orbital elements of the A-train formation of satellites -- already up -- with which it will fly. The CloudSat home page linked at the top of this website also contains information on CloudSat. But what about the orbit? How directly will my observatory be affected? JPL ran some simulations based on the A-train orbit which, as it applies in 0-order to CloudSat now, repeats on a 16 day cycle; in actuality, atmospheric drag will cause 10 km horizontal differences which will evolve over the course of the mission, necessitating constant updating of the orbital elements. After launch, CloudSat will fly somewhat off to the side of the main body of the A-train -- of order ~210 km . Any guesses why? The simulations were meant to be representative, not definitive, and results are shown here. Sites highlighted in red were overflown within 15 km during the single, repeating, simulated 16 day cycle and so considered -- in this context -- almost certain to have an overflight (because of the deltas introduced by atmospheric drag) while other sites were overflown within 30 km or more distance, and are less likely to have a direct overflight. As may be seen, most observatories may expect to suffer overflights -- it is after all a global mapping experiment, see Figure 2 of the ALMA memo -- and all will suffer the effects noted above here and in the linked info. How do I get detailed orbit information for myself and my site? General public access to TLE has recently been somewhat revised. For direct access it is necessary to open an account at www.space-track.org: before registering, be sure to read the required user agreement, which severely restricts the legal uses to which information gained from the site may be put. Fortunately, the functionality of Celestrak has been preserved, at least temporarily ... see (if you will) under "NORAD Two-Line Element Sets, Current Data," "Weather and Earth Resource Satellites, Earth Resources" -- i.e. here. In any case JPL will provide astronomers with updated elements, obviating the onerous requirements placed on users of space-track. Of the many satellite orbit prediction programs available, some are very precise but others are extremely poor. One of the most precise is "TrakStar" which is available from the Celestrak web site; for an index to this and many other programs, including in some cases source code, click here or follow the celestrak links at the left side of this page. Tools at various levels for different platforms are also linked on the AMSAT home page. JPL has promised a web-based tool which for a given location on the earth will calculate precise orbital positions (az, el. etc. vs. time) unfortunately this tool will not always have the absolutely most up-to-date orbital elements and its utility for on-going radio astronomy observations is unclear. As of the end of May 2005 the JPL tool had been beta-tested by IUCAF and was undergoing revision by the developer. If implemented it would recognize a list of sites so that coordinates need not be entered repeatedly. For now, you might check here or on the list of telescopes at left to see whether your site has been included already. If so, please check the coordinates. If not, please contact JPL. CloudSat is also committed to archiving historical orbital elements. Integrated satellite tracking/visualization tools are available for handheld devices at the PocketSat+ web site cited at left. On a Tungsten E, this code (once registered for $25) required less than two minutes to find all the tracks where AQUA rose above 3d at the ALMA site over a 16-day period. It uses the usual TLE, current versions of which are kept available in .pdb format, and plots passes or satellite positions in real or accelerated time.